Traveling in Italy makes me happy! 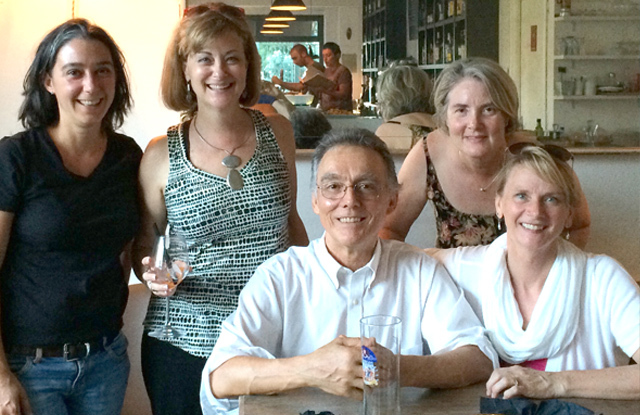 It makes me happy to also travel with others who enjoy speaking and learning the language as much as I do. Here is a brief recap of previous trips that I have organized together with Italian Language Schools, Travel Experts and Tour Guides. 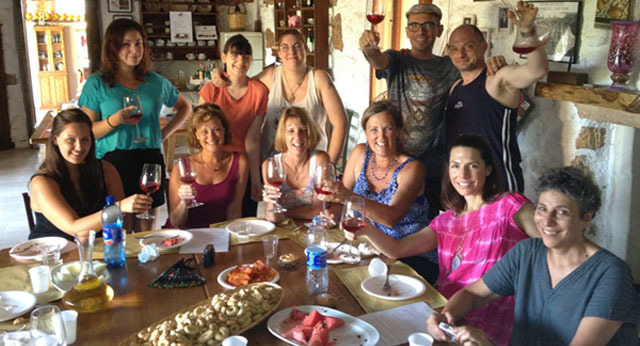 2016 – September 1- 12 Arezzo Another unforgettable “Matta” Language & Cultural experience. 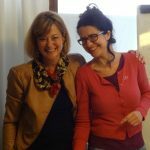 In September 2016 I teamed up with Paola Testi, the director of Cultura Italiana Arezzo Language School for 12 days and 11 nights of Italian Language Learning fun! During the mornings we studied at Cultura Italiana Arezzo Italian school, located in the historic center of Arezzo. During the afternoons we participated in excursions in and around Arezzo, with teachers and guides from the school. We will enjoyed spending time in the delightful city where they filmed “Life is Beautiful” with Roberto Benigni. We also experienced the famous Giostra del Saracino – Arezzo’s jousting festival that occurs every year the first week of September. 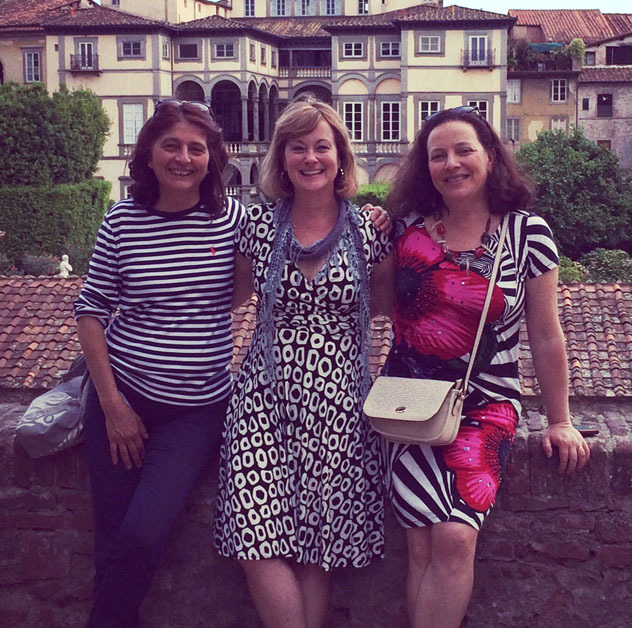 2016 – June 19 -30 My friends Daniela, Angelo & Eva, teachers at Lucca Italian school and I planned another exciting and successful language & cultural program in the charming medieval walled town of Lucca, in Tuscany. 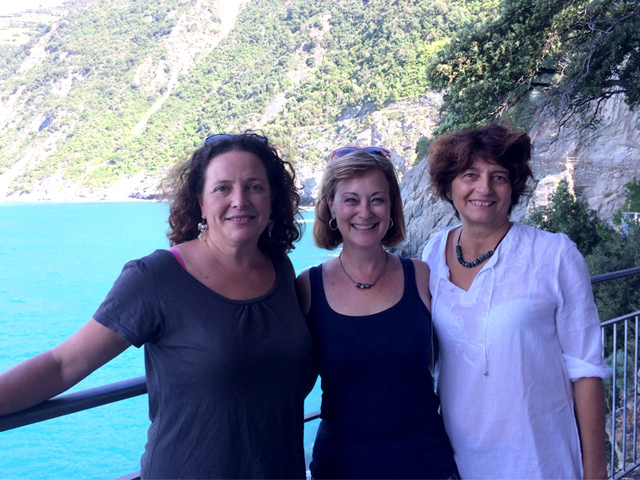 The 2016 program included excursions to the cinque terre and into the Garfagnana Mountains. 2015 – September 11th – 22nd: Lucca! The teachers at the school and I organized another wonderful program combining language classes and activities and excursions. The goal being to explore Italy as we deepen our understanding of the language. The 2015 program included a day trip to to the CINQUE TERRE in Liguria and we were in Lucca for the FAMOUS LUCCHESE FESTIVAL OF THE HOLY CROSS, one of the most important events that occurs in city on September 13th. We will took part in the celebration, observing the candle light procession through the town. We watched a film, we went to a concert, climbed towers, learned to cook, we sang and we went on many excursions. But most important, we took classes at the school. 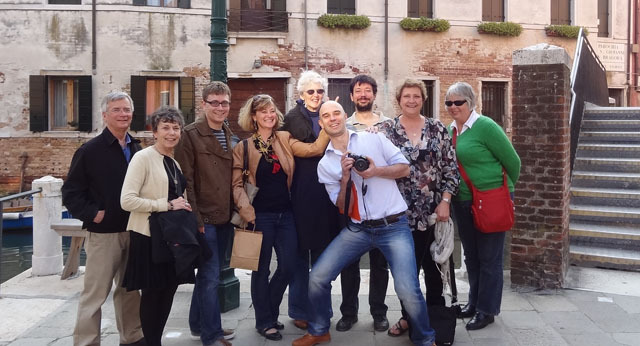 It was such a delight for me to travel with this lovely group. 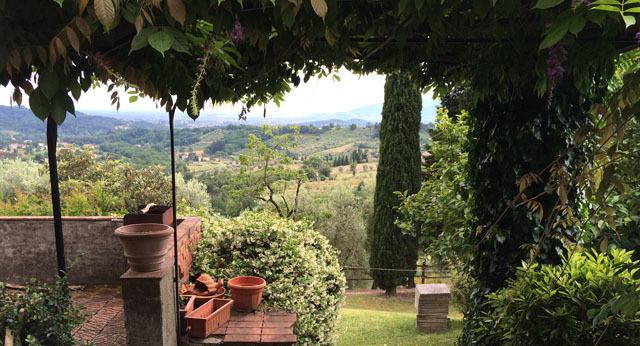 Check out the photo highlights from the 2015 Lucca trip. 2015 – July 5th – 14th: Rome! Art & Language in Rome! 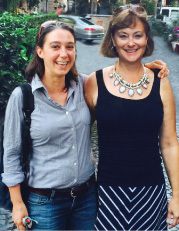 Our 10 days in Rome combined language lessons at Scud’It with Art lessons with Kelly Medford. We stayed just around the corner from the Colosseum and every day embraced the Roman life style, learning how to take the Metro and get around the city like pros. We were also entertained by Roman friends who joined us each day for conversation over dinner in various venus around the city. During the evenings we also enjoyed typical summer Roman summer activities. One night we attended a picnic at Frascati, a summer festival with wine and music in the hills of Rome. We also enjoyed drinks and dinner Lungo il Tevere and then watched an open air movie in Trastevere. One night we also saw Shakespeare’s Midsummer’s Nights Dream in Italian in the Villa Borghese and another evening we toured an ancient Roman wall and tasted ancient Roman cuisine and yet another evening we visited the Vatican at night for a “candle light” tour! I just have to say that the week, despite being pretty hot, was amazing! Kelly, Roberto and all the teachers at Scud’It, old Roman friends and new acquaintances made our time in Rome unforgettable! I can’t wait to return to Roma! 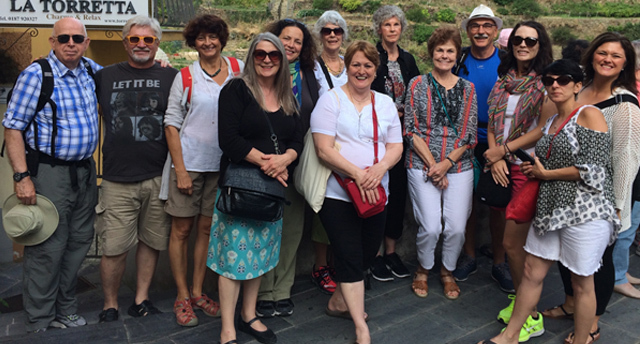 Check out the photo highlights from the 2015 Rome trip. 2014 – June 1-12 2014: Lucca in Tuscany My group and I had a fantastic experience in Tuscany in the beautiful walled city of Lucca. We studied in the mornings at Lucca Italian School and explored the town and surrounding areas in the afternoons with our teachers and guides. We truly immersed in the language and culture. During our “soggiorno” in Lucca we stayed in the heart of the city close to Piazza S. Michele at il Piccolo Puccini. We became locals. 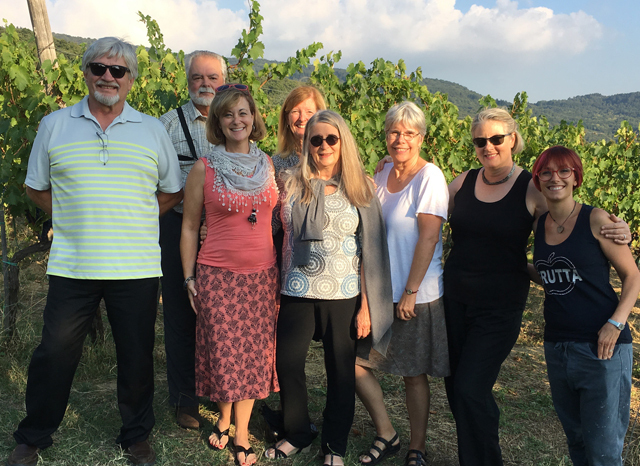 We ate well, we conversed all day long in Italiano, we cooked, we sipped wine, we even climbed to the top of the Giunigi Tower to take in the breath taking vista of Lucca as seen on high. We made day trips to Pisa and the Garfagnana and Barga, as well as to Forte di Marmi and Pietrasanta. 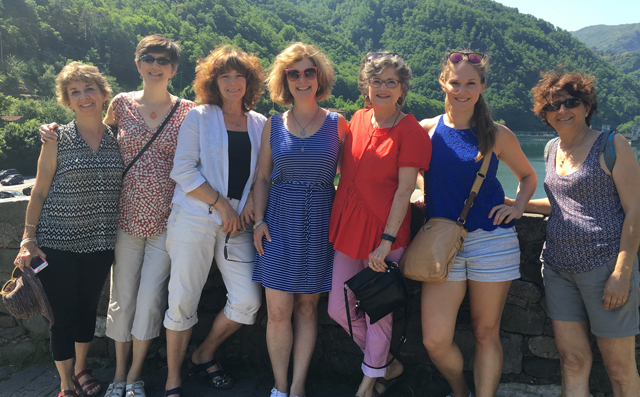 We toured a medieval castle and attended a concert of Puccini arias. But the best part of living in Lucca are her walls…le mura that surround the city. How wonderful to walk and bike along the walls like a local and enjoy life in Italy! I will be going back in September 2015! 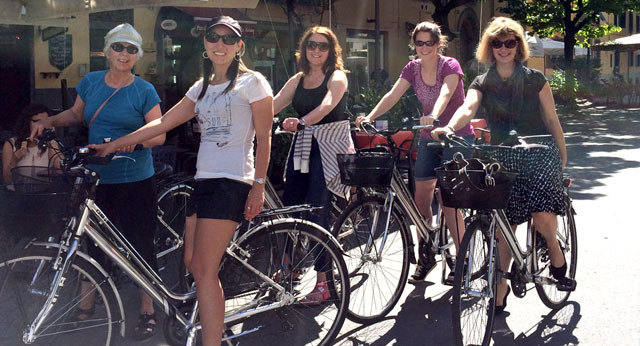 Check out the photo highlights from the 2014 Lucca trip. 2013 – September 14th – 21st : Matera in the Basilicata Ilaria Navarra of Percorso in Italy, and I organized a language immersion experience in Matera. In September 2013 we travelled to the ancient city carved out of the rugged rocky terrain called “sassi”. 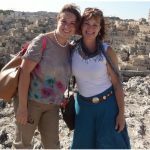 During our week stay in Matera we took a “tuffo” into the language and culture of the Basilicata. We stayed in local B&Bs sprinkled around the city and just a short walking distance from the school where during the mornings Ilaria lead morning Italian classes. In the afternoons we continued practicing our language conversation skills & guided by local experts, we experienced a new cultural activity every day. We cooked, sampled local wines, cheeses and olive oils, and also explored the recently discovered la “cripta del peccato originale” which features amazing paintings dating from the 9th century. I will never forget looking back across the ravine my last day in Matera and hearing the sounds of music from the local conservatory floating over the city. Truly a remarkable adventure and I thank my partner for making the week especially amazing for us. 2013 – April : Venice Diego Cattaneo of Venice Italian School, invited me to facilitate a group to study at his school, and he & the school orchestrated and arranged our lodgings and all the activities during our stay in Venice. The Venice experience taught me not only how to better pronounce le doppie consonanti /double consonants (as in the word “anno”!) but also to be flexible and to “go with the flow”. Fortunately we didn’t literally “go with the flow” as the waters of Venice behaved themselves. No acqua alta for us & despite 2013’s unpredictable wet & cold spring weather, upon our arrival in la Serenissima it turned warmed & sunny. The first day we experienced a “sciopero” water tax strike & quickly had to rely on our feet to get us around. We stayed on Giudecca Island, in a renovated monastery where the beds, baths & rooms were small & the amenities sparse, but economical & clean. In the morning we bought cornetti & cappuccini at a neighborhood bar and rubbed elbows with the local tradesmen. We crossed the canal in our “school bus/traghetto” to study at the Venice Italian School, located around the corner from Santa Maria Gloriosa dei Frari, where you can find Titian’s Assumption of the Virgin. In the afternoons we visited churches & used book stores & the Rialto Fish market. We met carnival mask makers & observed glass artists as they worked with hot molten glass. We also learned to row a gondola at a local yacht club and we made the classic Venetian dish called “sarde in saor” a sweet & sour take on sardines. Due to some some physical limitations of our group we didn’t go on the scheduled bike ride along Venice’s Lido, and because our group’s language skills trended to very beginner levels we didn’t perform a treasure hunt in Venice, so instead we added a matinee performance of Rossini’s opera La cambiale di matrimonio at Teatro Malebran to the itinerario. 2012 – August : Lecce in Puglia In 2012 I co-lead my first group in Puglia with my partner Ylenia Sambati. Lecce (the Baroque capitol of the south) and the countryside of Puglia are both fascinating destinations, despite the heat of August! I learned that perhaps August isn’t the best month “heat index wise” to visit the Salento, but on the other hand what other time of the year can you experience Ferragosto and the multitude of local festivals from Locorotondo and Ostuni to Lecce! In 2012 we stayed in a Masseria, a renovated farm house in the country surrounded by olive trees. 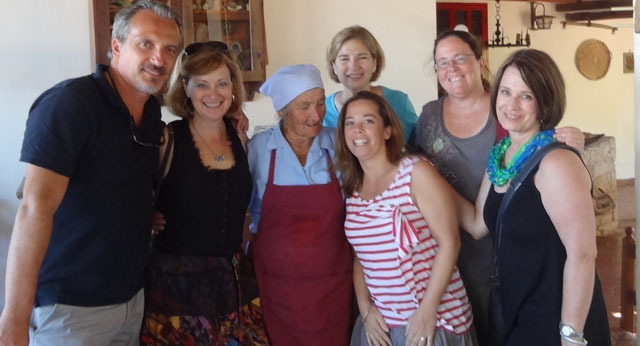 We cooked with Italian mammas, went to the sea, danced the Pizzica the local folk dance and learned the art of Cartapesta from local artists. The pasta of this region is “orecchiette” and I learned it takes a bit of practice to make perfect “little ears”, but one improves one’s pasta rolling technique with a glass of wine in one’s hand. 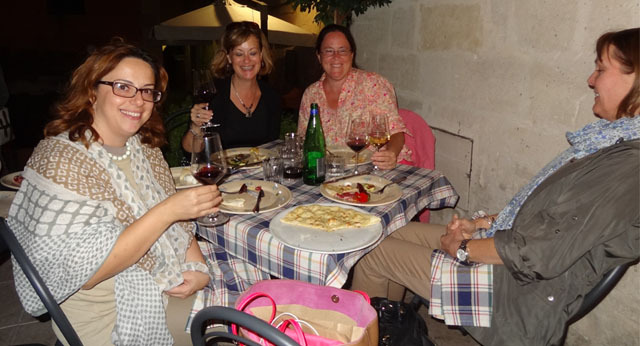 Speaking of wines…Puglia has some amazing ones and is one of the biggest areas in Italy to export wine. We learned this from the maestro himself at Candido Winery. And yes! it is possible to do yoga under the olive trees despite the august summer heat…especially when you can cool off in nearby pool that has an olive tree growing out of an island in the middle of it. 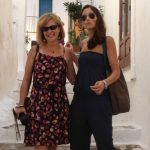 But best of all, I learned that my partner Ylenia Sambati is a TOP NOTCH GUIDE, language teacher, as well one well connected lady to all the goings on in Puglia!